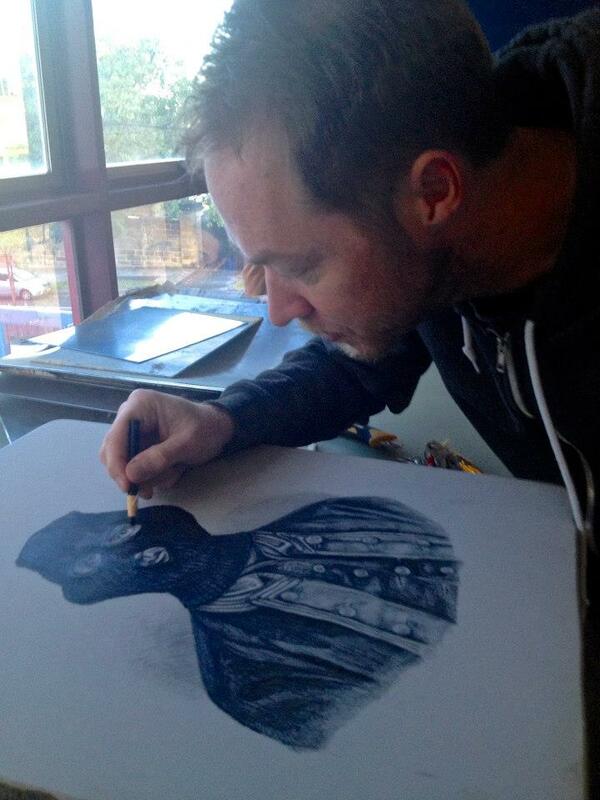 Jason Wing is a prolific Australian artist, working in various mediums to examine social and cultural identity. Being of Aboriginal and Chinese heritage he owns this experienced duality between two cultures in the adjudication of his body of work, which was activated in street art and has continued in photography, painting, installation, sculpture, and now, printmaking. In correspondence with Jason Wing I asked him about his experience at Cicada Press in 2012 and the transference of an idea through different mediums. 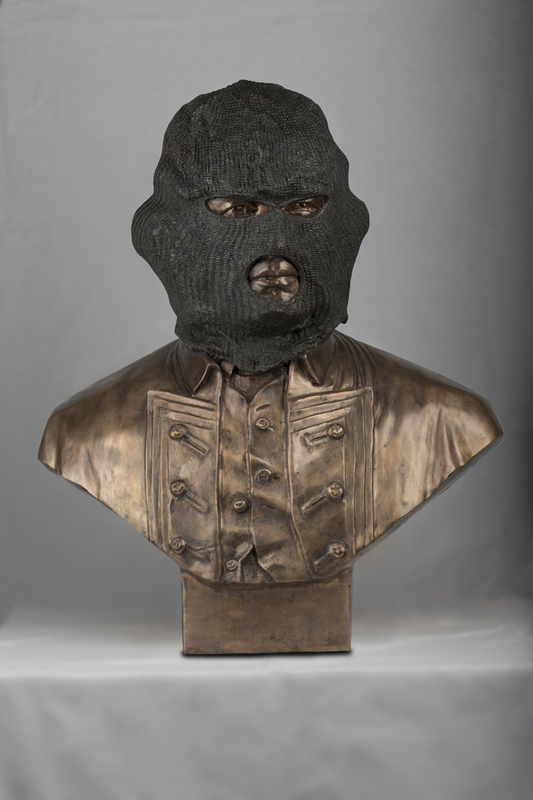 In 2012 Jason Wing was the winner of the Parliament of NSW Aboriginal Art Prize with his work Australia was Stolen by Armed Robbery, a sculpture which entailed the placement of a balaclava over a readymade bust of Captain Cook. The lithographic print created by Wing at Cicada Press is a ‘conceptual extension’ of his original sculpture, each work addressing the ‘commonly held misconception that Australia was colonised peacefully’. To correct this misreading of history, Wing explains, his intention is to ‘offer an alternative perspective’ to the ‘British-centric version of invasion’, taught in Australia. As the Prize was exhibited at Parliament House, Wings critique of this commonly taught (though growingly unaccepted) view has added poignancy. Wing asserts that the context of its display ‘was of extreme significance’ as it is at ‘Parliament House where legislation controlling all aspects of Aboriginal people’s lives are drafted and passed’. The forcible acquisition of Australia, as articulated in Wing’s motif, ‘was the original sin’. This instance triggered the ‘tone for the Government’s ‘handling’ of Aboriginal people’ and every policy to follow that endeavoured to ‘disempower Aboriginal people’. Government policies often further demonise Aboriginal people, Wing adding they are often ‘flat out racist’. By embodying Captain James Cook as a criminal, Wing has disempowered his historically dignified role as the oft celebrated discoverer, asserting him as a direct symbol of the theft of Aboriginal land. With this work, Wing has added to a trajectory within cotemporary Australian art that challenges historical perceptions through the articulation a different perspective, the perspective of the original custodians. Wing had the idea for the criminally clad figure five years ago, though without due resource to commission a bust he kept a keen eye on auction sites for a statue fit for the intended role. Shortly before submissions for the Parliamentary prize were due, Wing found a suitable contender for the realisation of his idea; an affordable fibreglass sculpture. The potent statement of its re-contextualised guise awarding him the $40,000 Parliament of NSW Aboriginal Art Prize in 2012. However, as a result of subsequent media attention, following the award of the Parliament of NSW Aboriginal Art Prize, the ready-made sculpture became the subject of an intellectual property and moral rights challenge. The potential case also touched on copyright, artist’s protection and appropriation. The associated risk of appropriation is particularly interesting, as the theoretical nature of appropriation transgresses the rules of copyright. As the bust was purchased via ‘private sale from a third party’ an additional question in the alleged case was resale protocol. In the listing, there was no edition number or certificate of authenticity, Wing explaining that the ‘price, material and lack of documentation’, on the whole, suggested mass production. This and the sale from a third party offered no reasonable basis for him to convey his creative intention in the transaction. To offer Wing creative support and assist in rectifying the notion of the idea being owned by the artist, COFA lecturers, Michael Kempson and Tess Allas, invited Wing to recreate the piece in a limited edition print at Cicada Press. Kempson explained that the translation of Wing’s idea in printed form ‘removed the issue of the Cook sculptural element without diminishing its coherency’, the extended invitation also demonstrated how serious Kempson and Allas, through COFA UNSW, are in ‘supporting worthy artists at Cicada Press’. When producing the piece, Wing referenced a historical portrait of Captain Cook and created a composite image as opposed to referencing the sculpture directly. This was out of consideration for the parties involved in the potential case, still active at the time. 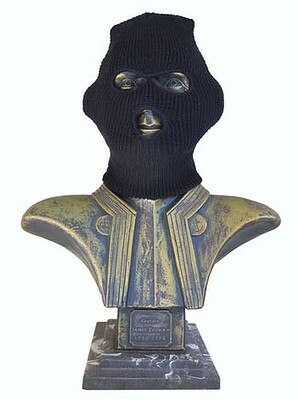 In 2013, a second version of the sculptural bust was made in an edition of three, one of which has been purchased by the National Gallery of Australia. As lithography was commonly used in the production of colonial portraiture, Michael Kempson suggested and Wing agreed that it would be a fitting technique for the production of the print, Wing adding that ‘the original sketches of Captain James Cook were reproduced using the lithography technique’. In reference to such source materials, Wing created a drawing that honours the appearance of such traditional lithographs, adding an ‘element of absurdity’ to contemporise the content and create a new subtext to the portrait. 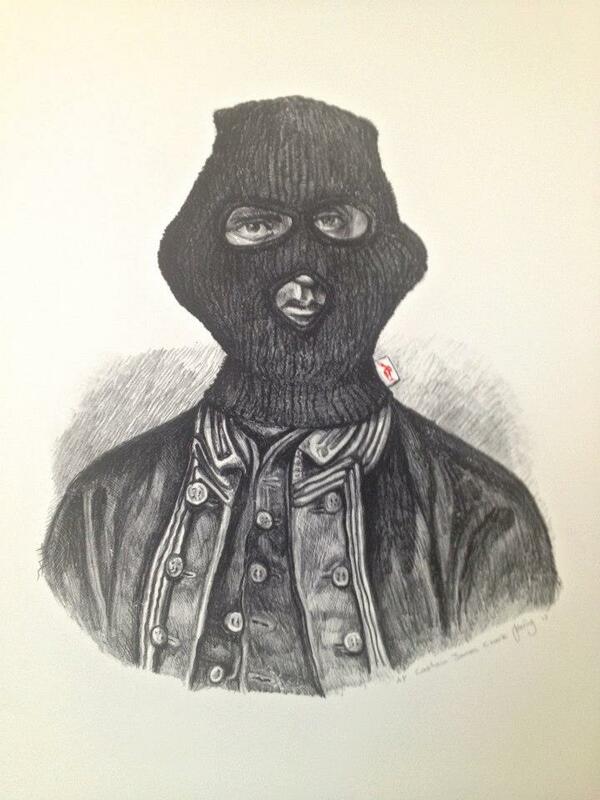 The lithograph marks a ‘conceptual extension from the original bust’, further ‘challenging the notion of appropriation’. The simultaneous appropriation of both new sourced material and Wing’s re-contextualised sculpture asserting ownership of the original idea. A good concept enables the prospect for further exploration across multiple mediums, a contributing factor for the invitation extended by Cicada Press. 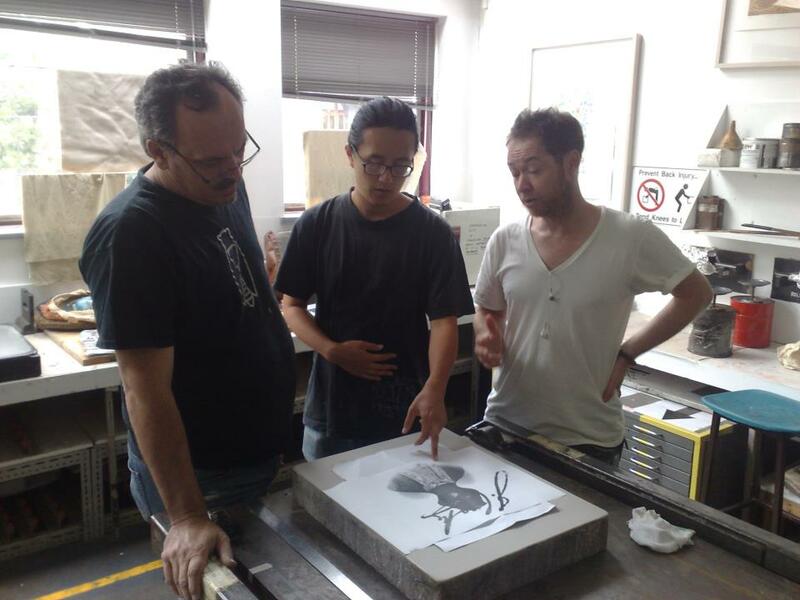 Like many artists invited to Cicada Press, the techniques of printing were unfamiliar to Wing who said the process was a collaborative effort. Working alongside Michael Kempson and Jason Phu, Wing said, ‘apart from their dashing good looks and great break dancing moves, they are both incredibly skilled printers” and offered technical support throughout the process. Wing followed onto say Phu’s explanation of the practice through ‘demonstrations and technical tips’ assisted in his understanding of the process and helped him ‘visualise the end result’. To construct the image on the limestone, Wing drew onto the surface, or matrix, with a lithographic pencil utilising a range of drawing techniques and building up the image in stages. The consistency of the pencil leaves a layer of grease on the stone that is fixed to the matrix through the etching process. When the image is completed, acid and gum arabic is applied to the stone which persuades the grease to attach to the surface, making it ready to print. Before inking up, the matrix of the stone is dampened, creating a resist that prevents the ink from attaching to the negative space and only to the image. 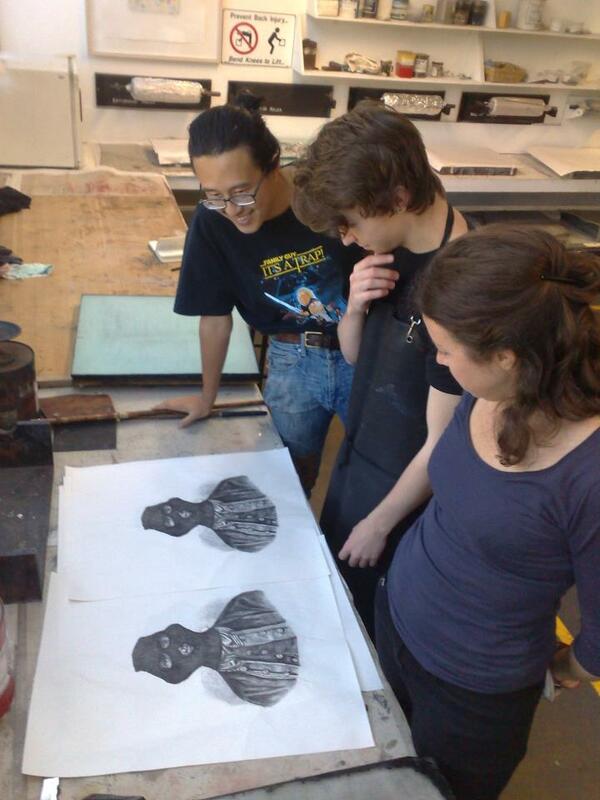 The Cicada Press lithography team, Jason Phu, Angela Butler and Jack Nibbs, editioned the print on Wing’s behalf. Butler explained that when printing a lithograph the ink is always built up slowly in successive layers to avoid smudging and bleeding. She went onto say, that as Wing’s print has such fine detail and line work the litho team needed to be especially considerate when inking this work to ensure consistent results while editioning. Nibbs added that to ensure even coverage, the team used different rolling techniques for different sections of the work to achieve the intended tonal quality. Butler also offered the insight that such nuances exist at each stage of the process as everything in lithography is done by hand, from the graining of the stone’s surface, to careful etching of the marks, to the final print: ‘each stone has its own idiosyncrasies’, Nibbs agreeing that ‘they’re like people’. Further adding to the stone’s personification is Wing’s masked figure. 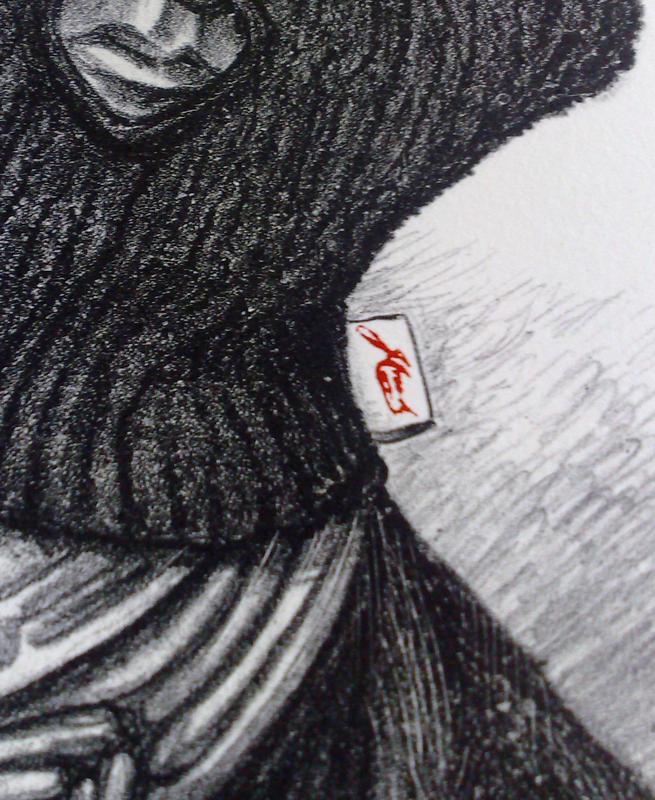 The tag of the balaclava offering a link to its wearer, with the words ‘J.Crook’ appropriated from Captain James Cooks ‘own handwriting and coloured blood red’. Following the completion of the edition the tag was screen printed by Ben Rak. In 2013, Wing’s Captain James Crook lithograph was included as part of the exhibition, ‘Black Prints From Cicada Press’, curated by Tess Allas at the Kluge-Ruhe Aboriginal Art Collection in the United States. As the exhibition title suggests, Wings print was accompanied by a diverse collection of prints by Indigenous Artists who have worked at Cicada Press, such as Vernon Ah Kee, Reko Rennie, and Gordan Hookey. This work was also included in the exhibition ‘Kaouwi Kaowi’ at the Kahnawake Mohawk Territory as part of the 2013 Montreal First Peoples Festival in Canada. Having ‘collected many prints from Cicada Press’ himself, Wing stated that prints are ‘a great affordable way to collect original art’. As his ‘sculpture was a one off artwork’ the nature of its transferral into a printed edition provides an assessable opportunity for acquiring artwork ‘that otherwise may be out of many people’s reach’. While in the studio, Wing met ‘other visiting artists such as Fiona Hall, Reg Mombassa and Reko Rennie ’. He also engaged with students who were curious as to ‘who the person underneath the balaclava was’, which ‘led to many discussions about Australian politics and perceptions.’ Reflecting on his experience at Cicada Press Wing says he was ‘made to feel very welcome’ and was ‘challenged as an artist to do something outside of my comfort zone’.